Hit up the One Zero Seven concert during my lunch break, and it was awesome. I’m not sure I could see myself listening to their music on CD very often, but their live show is really great. If you’re tired of watching two guitarists, a bass, and drummer at every concert, you should definitely check them out. 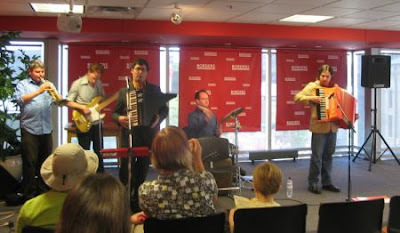 They do an eclectic mix of indie pop and world music using a claviola, accordian, trumpet, bass, and suitcase drum set. That’s right, a drum set that’s designed to fit inside of a suitcase. When you unpack it, the case itself becomes the bass drum, or at least a kick-drum. Now I’m at Argo Tea, which apparently gives you just 2 hours of free WiFi with a purchase, but I can’t really blame them. The dude in front of me, incidentally, is using exactly the same computer as me. But he’s surfing in Internet Explorer. It’s the little difference that make the world go round. Here’s another photo, featuring the funny looking Claviola. It’s kind a cross between a harmonica and a piano/organ/accordian.